A 3-week art installation called “Mad Homes” will open on Saturday with a special celebration 4-7pm. 11 local artists have created installations and sculptures on four adjacent home sites, slated for removal to make way for the BelRoy Court re-development project. 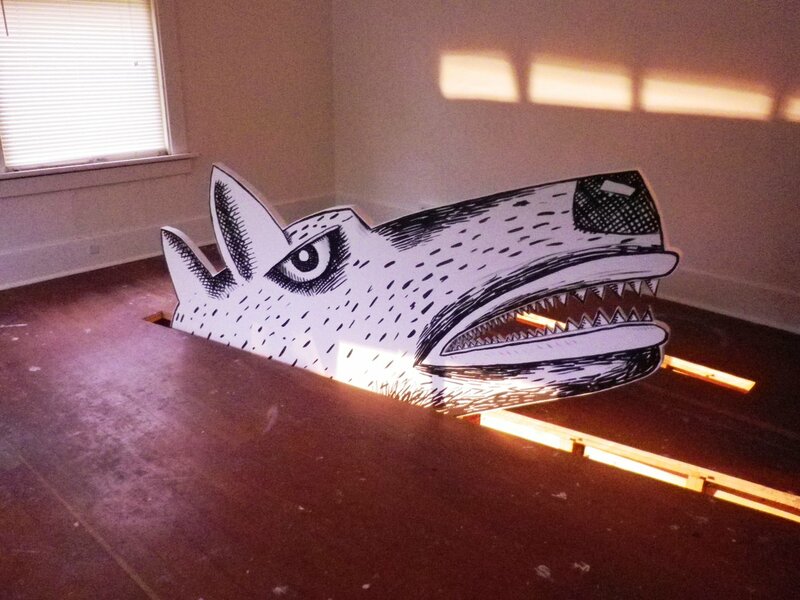 It’s doubtful that the home that artist Allan Packer installed his installation in will be salvaged, sold and moved, as he’s cut holes in several walls, ceilings and floors to allow his fanciful cut-out animals to play peek-a-boo between the floor joists and wall studs. I met the previous owner, Mr. Walt Riehl. He said he had owned the property for many years and his parents had owned the apartment building next door, the Bel Roy Court. The development firm his parents sold to, Point32, has bought Mr. Riehl’s 4 homes and plan to develop them in a manner sensitive to the 1930’s art deco look of the Bel Roy, with the majority of the building being the current height of the Bel Roy, with only the NE side of the property reaching up to 6 stories. Walt had said that he always intended on developing the site, but just never got around to it, so decided to sell to Point 32, the same company who designed the Cascadia Center for the Bullitt Foundation on Capitol Hill. I asked Walt how he felt about the transformation of the homes that he owned for so many years, and he was thrilled. 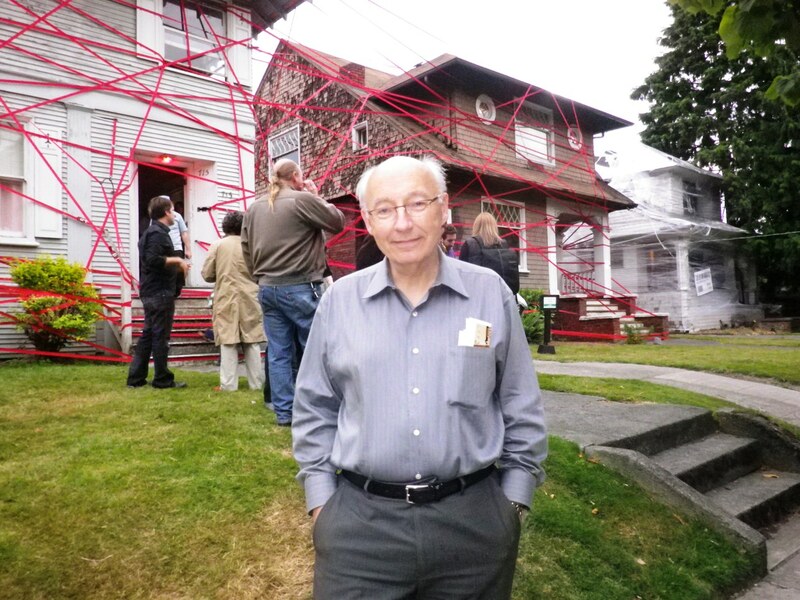 He’s an art supporter himself and is currently on the board at Pratt, so he’s excited to see these homes put to use before demolition. One of the more intriguing installations is a “house” created by artist Laura Ward. 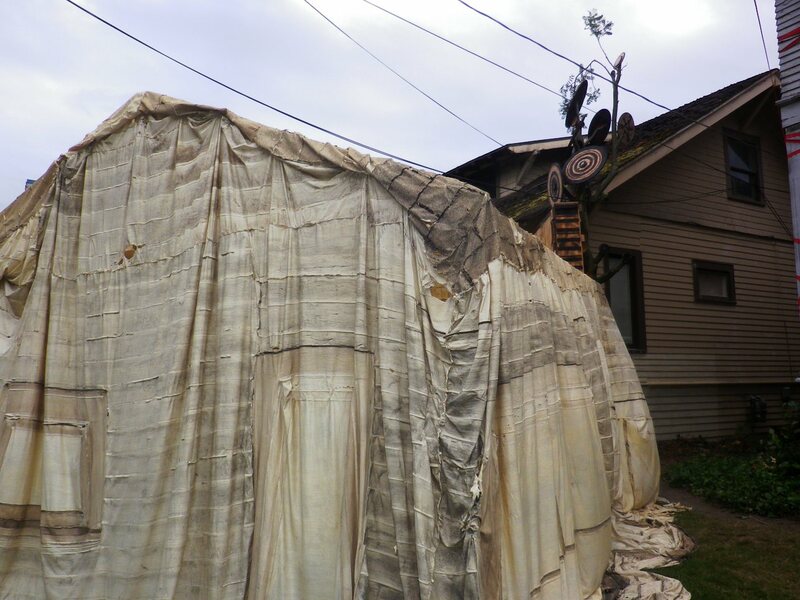 Laura used latex to create a sort of skin that drapes over an armature to create a smaller house that will live in the front yard for the 3-week art show. 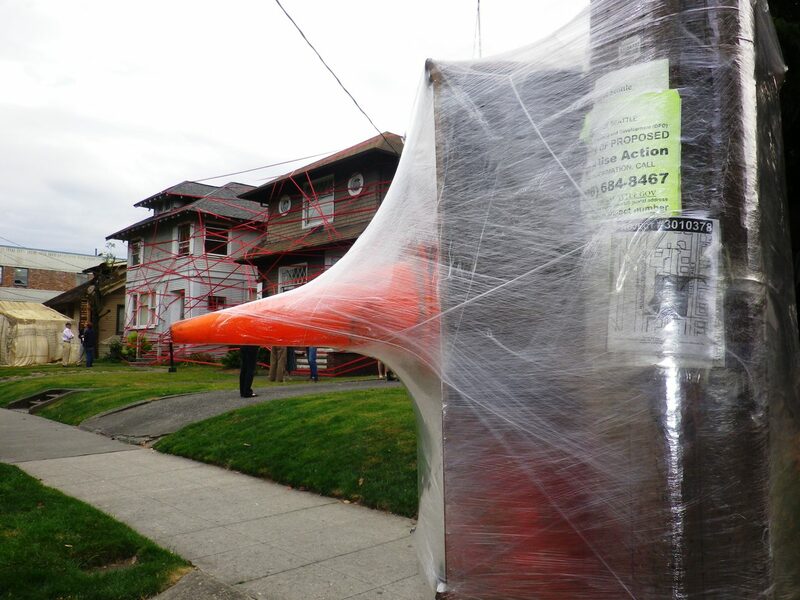 She painted the exterior of the homes slated for demolition with a rubber latex solution, waited for it to dry, and then painstakingly tore it off and re-assembled the skin and sewed it back together to create a new skeleton house. The founder and instigator of all this madness is Mad Art founder Alison Milliman. She’s the brains and energy behind several of Capitol Hill’s most memorable art projects, including Mad Art in the Park from last summer and the Window Art Project she put together in Madison Park. 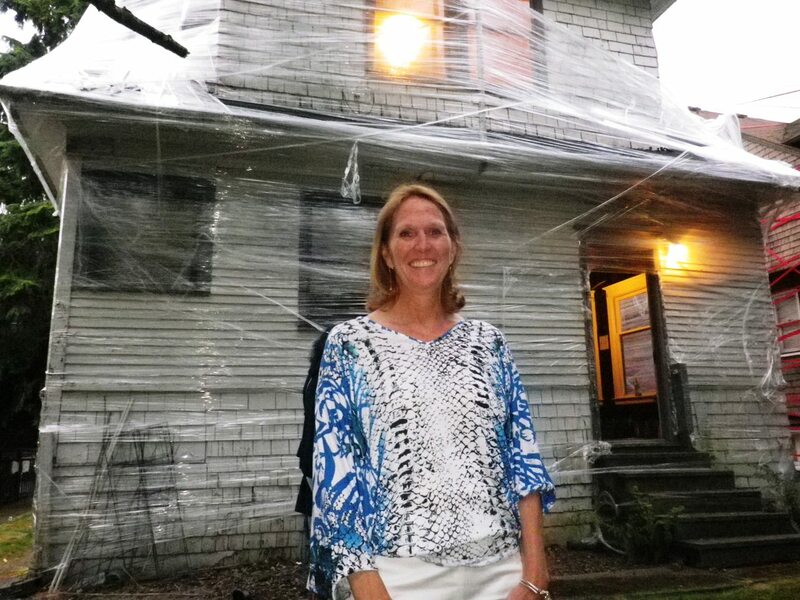 Here she is pictured in front of Troy Gua’s plastic-wrapped home. th from noon to 7pm daily. Artists include Troy Gua, Julia Haack, Meg Hartwig, Luke Haynes, Amanda Manitach, Ryan Molenkamp, Allan Packer, Jason Puccinelli in collaboration with Elizabeth Potter, Sutton Beres Culler, Laura Ward, & Allyce Wood. “Philtering” by Puccinelli and Potter was beautiful, ingenious, and incredibly creative. “Ties That Bind” by Sutton Beres Culler was simpler but just as provocative and perfectly suited to the space it inhabited. Is this still going on through SeaFair weekend?